20 | January | 2015 | Sally Ember, Ed.D. 01/20/2015 by Sally Ember, Ed.D. This post is longer than usual, but it includes personal experiences, research and citations, and my 5-Point Plan. If these topics interest you, well worth your time. I’ve had it. I’m fed up. A) Long-standing problems of prejudice, brutality and out-of-control behaviors by police are rampant and supported by other officers. I successfully sued my local police department back in the 1980s for false arrest, harassment and attempts to intimidate me out of making a police brutality complaint. I caught local police officers beating up a juvenile for hanging out in a supermarket parking lot where I happened to be shopping (four: two hitting, two watching and doing nothing). After taking down all the officers’ names and badge numbers, which the abusive ones tried to prevent me from doing, I walked the one block over to the downtown center, where the police station and city park were. I had just gone swimming with my family prior to shopping. My partner had taken our son to the city park while I shopped, agreeing to meet up after I was finished. The witnessing I had chosen to do had made me about a half-hour late, which is very long by baby standards. The park was right across from the police station, so I met up with my partner and our toddler. As we walked over together, I explained my mission. My son was very hungry and not too happy at my having been delayed in reuniting with him. I sat in the lobby area breastfeeding him, chatting with my partner while waiting to make my formal complaint. One of the abusive officers happened to walk by as we sat there. When he saw me, he asked the desk officer why I was there. I could hear them talking. A few minutes later, he came toward me, looming over my chair where I sat nursing my son. He was screaming and yelling at me, saying that I was under arrest. I laughed at him and told him he was out of line, thinking maybe this was a strange idea of a joke. But he insisted he was serious. I looked over at the desk officer, who shrugged, indicating that I had to go with this still-screaming officer. I asked if I could take my baby, since he wasn’t finished eating, but the officer spit out an emphatic “NO!” Reluctantly, I handed our baby to his father and went with this insane man with a gun to the PD’s basement. What he had in mind, I had no idea, but I could scream very loudly and planned to do so. Having taught junior high school for several years prior to this and having had an extremely abusive father, it took a lot more than screaming to intimidate me. When we got downstairs, he got out an old typewriter and began to beat out his arrest report, barking and yelling each question, until we got to my age. When I said “27,” he realised that I was not, as he had presumed from my youthful appearance, a teen mom, but was actually older than he was. He immediately stopped yelling. However, he somehow still felt compelled to continue with this absurd arrest. He took my mug shots and fingerprinted me, then told me to go back upstairs. With inked fingers, I went back to the lobby and continued to feed my baby. I told my partner what had happened, both of us incredulous and disgusted. The Lieutenant called me in. I told him that I had just been arrested while waiting to make a complaint about police brutality. He asked, “On what charges?” I told him what the officer had told me, not able to withhold my laughter: “‘Resisting arrest, interfering with a police officer, and intimidating a police officer’ were the charges,” I told him. Knowing that I am 5′ tall and the officer is well over 6′ tall, I assume that is the reason this Lieutenant looked startled. The Lieutenant put his head in his hands and shook his head, apologizing. “That should not have happened,” he told me. He listened and took notes for my formal complaints, now plural. I found a great lawyer who took my case on contingency and sued. I also testified on behalf of the juvenile and got his arrest expunged. Due to my lawsuit, which we settled out of court for a sizable sum pending several conditions, these were met as follows: the two main brutalizing officers involved (one of whom arrested me) were fined, reprimanded and left the force; training and supervision for all patrol officers were improved and made mandatory even for veterans; the Lieutenant who balefully and with great chagrin received my actual complaint and acted on it was made Captain of the force, replacing the one who had been ignoring such behaviors by those he supervised. B) Police do what owners and managers of businesses tell them to do regardless, of actual laws. I walked out of another courtroom due to false arrest charges’ being thrown out. Three years later, a manager of a local movie theatre had asked me to stand up while waiting in an ever-growing line, but I had explained, calmly, that I had a bad leg and couldn’t do that. He then asked me to move to the benches lining the walls, but I didn’t want to lose my place in line, so I politely refused. He threatened to call the police. I looked up from the magazine I was reading (happened to be MS.) and asked on what charge? He blustered a while, then yelped, “Trespassing.” I showed him my ticket and told him to go away, call the cops, do whatever he wanted, sure of my legality. A not-very-assertive officer from this same police force showed up at his call. Despite my showing this officer my ticket and explaining about my disability, he apologetically arrested me. When asked, he told me the charge was “Trespassing,” but even as he said it, I knew he was aware of that charge’s being ridiculous. As I was being led out by this officer, the manager hurriedly gave me a refund. As the box office worker reclaimed my ticket, the manager loudly claimed that NOW I was trespassing. I pointed out that at this moment, I was standing while apparently under arrest, so which did he want? Standing or leaving? He ordered me to leave. I hired the same lawyer as in A, above, since our lawsuit had just barely settled at that point. He sent another attorney with me to the so-called trial (he explained the PD couldn’t just throw the case out because of my successful suit). However, the judge viewed the charge otherwise. Because a contention of “Trespassing” was obviously idiotic and illegal, AND because, once I appeared in court, the judge knew who I was, the case was thrown out during the “testimony” of the theatre people. During the initial questioning, both the manager and the box officer clerk admitted that the theatre had no such “must stand up” rule (I have had many mobility problems and couldn’t stand up for very long at that time). They also agreed, when asked, that the ticket stated right on it: “ADMIT ONE,” which meant I had had the legal right to be in the lobby, waiting to enter the seating area, in whatever way I needed to be waiting (sitting or standing). Since the case was thrown out, I dropped my suit. Every time I saw the arresting officer around town, he apologized. C) Police are too-often poorly trained and supervised for making arrests and handing out citations. A few years later, while I was still living in this same town, a patrol officer stopped me because he believed my car was overdue for the mandated semi-annual inspection. I told him that he was wrong and refused to get out of my car or stop because a 7-year-old friend of my son’s was meeting us after school at our house and, until I got there, no one was home. I told him, if he insisted on giving me a citation, he would have to follow me home (3 blocks away). He did, and gave me a citation, which I told him was ridiculous. I told him that a new law had gone into effect at the beginning of this month so that motorists had until the end rather than the beginning of each anniversary month to comply, and this was mid-month. He insisted my car was “out of inspection” and must be cited. A few weeks later, when this ill-informed officer had realized his mistake AND found out who I was (see A and B, above), he sent me a heartfelt, badly misspelled, handwritten apology, withdrawing the citation. In this letter, he claimed that, since officers had to purchase new manuals annually with their own money, he had not yet been able to afford one at the time of my citation. Since then, he assured me, he had done acquired a new manual and reviewed the new laws. He was now aware of the law’s change and told me I had been correct. I wish my experiences were unique, to be viewed as quaint, cautionary tales from the bad, “olden” days of the last century. Not so. To make matters worse, here is a major website for advice and tips to help potential candidates pass the entrance exam for incoming police, nationwide, http://policelink.monster.com/education/articles/40799-ten-tips-for-the-police-entrance-exam. 10) Proof read test. Before you turn in your test answer sheet, be sure to check it over. Test takers often leave answers blank and that impacts their final score. This also gives you a chance to go back and answer those hard to figure out answers. 1) Missing hyphens (“test-takers,” “hard-to-figure-out answers”). 2) “Proof read” as two words. 3) Pronouns with no clear antecedent (“that” in sentence three; “This” starting the fourth sentence). 4) Ending a sentence with a preposition (“over” in second sentence). How can we expect incoming officers to be smarter than the people who are providing them special assistance for passing these tests? These helpers apparently have substandard vocabularies as well as minimal grasps of usage, common punctuation and sentence structure. What about measurements of ethics, honesty, moral fibre, addiction, history of bullying or intimidation tactics used on weaker peers or others? Or, let’s check in on skill levels in key areas, such as problem-solving, decision-making, crisis response and management, communication (both listening and speaking), sensitivity and appropriateness with those unlike themselves: what do we find? Abysmal performance across the board. It’s not just “one bad cop.” There are now too many in too many places to keep track. I can’t remember all their names; can you? I strongly recommend that all policing entities implement my 5-Point Plan to Revamp USA #policing: qualifications, training, supervision and accountability as well as record-keeping, ASAP. Even that bastion of conservative moderateness, The Huffington Post, claimed last month (via occasional columnist, Tim Arnold) that “America has lost its soul” attributable to objectionably poor policing. My “last straw” landed when I heard about NYC’s Police Department’s former employee, Louis Scarcella. Recently, NYPD disclosed that Scarcella had been operating fraudulently and as an extreme racist for DECADES, framing innocent black men by violently coercing and purchasing witnesses and confessions from the innocent. Dozens (probably hundreds) of other cops knew about Scarcella (many helped him do these heinous acts), but turned a blind eye. Unfortunately, this type of story is not even front page news any longer. In city after city, state after state, dozens, hundreds, thousands of cops have been abusing their authority, overusing their weapons and harming citizens to the point of death. We can all see that the systems of policing and many of the individuals employed by them have been dysfunctional and dangerous for over a hundred years. Did they ever work well anywhere at all? Police who HEAD the Ku Klux Klan. and on and on, every metropolitan area. By what strange magnetic force are hundreds of thousands of these men drawn to careers in law enforcement, unsuitable as they are? How are they allowed to “graduate” from being their high schools’ resident bullies to earning money paid by our taxes to be community police? Most barely stop along the way to get any training as police, sheriffs, or marshals, excluding a possible stint in the US military (which makes EVERYTHING worse). It is now very clear to most of us that law enforcement attracts a disproportionate number of bullies with short fuses who harbor racist and sexist beliefs and who exhibit a horrifying willingness to hurt those they are paid to protect. There are many reasons for these officers to exhibit bad behaviors, but most do it to bolster their own pride and try to impress their buddies. These “public servants” are terrorizing their targets, many of whom have committed no crimes or may be guilt of very minor offenses. Far from serving their communities, protecting as they are mandated to do, law enforcement officials are now seen as those who frequently catalyze public and individual resistance. These incidents, with the concomitant lack of oversight and judicial consequences, are tearing communities apart. We have too many police, sheriffs and marshals who are engaged in a reign of terror that has been escalating almost daily. What should we do about it? I.- A. Refuse jobs in law enforcement to any candidates who have a history of bullying. We do NOT want to give bullies weapons, authority and clout, ever again. Check school records, arrests and reports, even those for which complaints and accusations did not result in convictions or disciplinary action. Charges that are made but repeatedly dropped or “forgiven” are the telltale signs of successful serial abusers. Look for Restraining Orders. Check school detention and suspensions records. Check military records. Remember how the Assistant Principal was always threatening that a bad behavior incident would go on our “permanent record” when s/he was trying to deter us? That threat was supposed to make us quake with fear and inspire us to change our ways. Well, THIS is a perfect use, an appropriate application of the contents of that permanent school record. I.- B. Refuse jobs in law enforcement to any candidates who have a questionable psychological, biological or social history. Public servants cannot belong to hate groups or who have engaged in behavior that encourages others to participate in hate crimes, harassment, threats or assault based on ethnicity, religion, assumed sexual orientation, age, occupation, disability or other differences, gendered appearances or creed. Check all the places these records might exist, including the “permanent record” from secondary schools, social media’s and websites’ postings, rosters of memberships in groups and clubs. Check military records, colleges disciplinary actions, any accusations and dropped charges. THEN give “clean” candidates a thorough psychological assessment designed to weed out any who harbor such beliefs but who have not yet been acting on them or haven’t yet been caught in the act. They should also be screened for tendencies to be or actual problems with being alcoholics, drug addicts, thieves, extortionists and other types of criminals as well as for vulnerability to being bribed or unduly influenced. II.- C. Prepare rookies more realistically for what they will face in the field. Rookies should always be accompanied by veterans with good records until they have faced, together, at least two of every type of common incident. If that means longer probation or training periods, so be it. 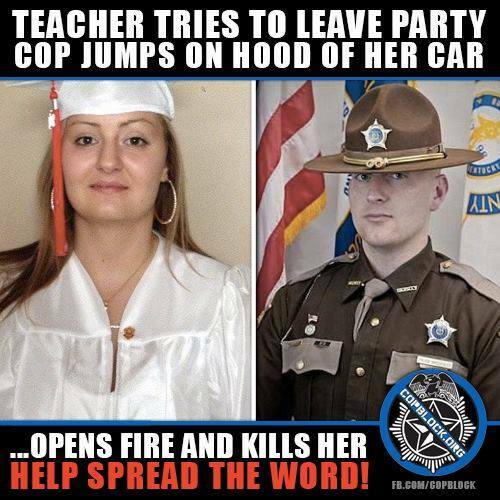 We should NEVER AGAIN have a cop on patrol who is not up to an appropriately high standard. Why do we ever have police who can’t tell the difference between a toy gun and a real one, who can’t admit when a potential suspect is NOT dangerous and leave them be, who harass someone playing music to the point of injury, who can’t determine when someone is legally blind or hearing impaired, who mistake his/her own gun for a taser, who abuse suspects, and who tamper with witnesses and evidence? II.- D. Include anger management and extensive therapy as part of the training and ongoing support for officers. Therapy, whether or not they show symptoms of needing it, should be an annual occurrence. Every law enforcement officer at every level should have at least three sessions/year. 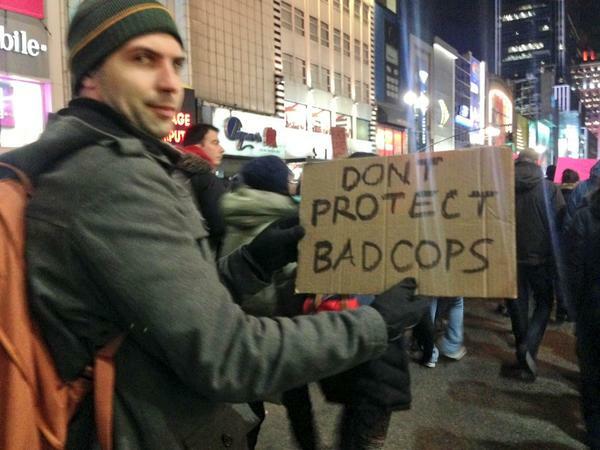 If community police are not feeling angry, they’re not paying attention. It’s managing the anger that is at issue, not feeling the emotion. Making both of these mandatory will weed out the psychopaths and sociopaths within the first twelve months because those candidates either will not agree to participate or will fail the therapeutic portions of the training and ongoing support. Whoever fails in either of these (where “success” is to be determined by the credentialed leaders/therapists responsible for conducting these sessions) can never be hired as law enforcement. No extensions, no re-takes, no possibility of moving to another locale and starting over. See V. National Databases, below. III.- E. Hold supervisors accountable for their underlings’ mistakes. Enforce this by making supervisors accountable for decisions that release rookies from probation/ ride-along status (see II, above) so that none is released “too soon” (as evidenced by making too many “rookie” mistakes) without there being repercussions upon the releasing supervisor. III.- F. Make sure every officer and supervisor is consistently and reliably evaluated. Written and in-person discussions of the written evaluations should occur without fail at least twice each year for veterans and monthly for rookies for the first 6 months or more, then bimonthly until they are no longer rookies. Poor evaluations must have immediate, serious consequences. Officers who do poorly must be demoted or have their duties re-assigned until they show substantial improvement within a given time frame. Some must resign/be fired, depending upon how badly they do and how many bad evaluations they have had without improvement. Guidelines for all of this must be clearly spelled out and followed. IV.- G. Harsher and more permanent penalties must be enacted for officers who break the rules and laws and/or who do not follow procedures and policies properly. By the time they are released from rookie probation (see II), officers must be immediately and permanently held accountable. Possibly like this: ONE SERIOUS STRIKE and they’re out. Examples: If they turn off their body or dashboard cameras or do not check to make sure the equipment is working prior to going on a call or on patrol, they are fired. If they are threatening to anyone for no legal reason, harassing and/or harming them, they are fired. If they break laws, do not follow procedures, interfere with fellow officers’ duties, steal or tamper with evidence or incur other serious charges, they are fired. IV.- H. Reprimands and Sanctions Must Be Strict. The type of work law enforcement officers do cannot allow for serious mistakes in judgment to happen without having the consequences of strict sanctions and reprimands. What about like this? One such lapse or error results in temporary restriction or demotion. If two or three lapses/errors in judgment occur, they’re docked in pay and the demotion is moved to long-term. If these occur twice in any 6-month period, they’re fired. If these occur twice in any two -year period, they’re put on temporary restriction or demoted, with changes pending results of an investigation to determine fitness for duty. 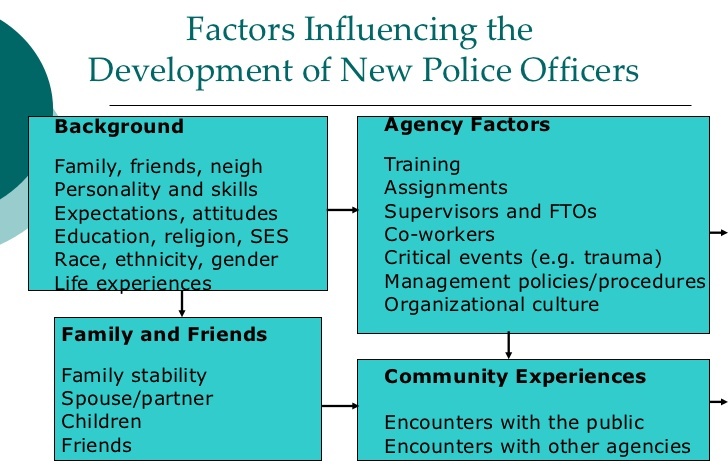 If outcomes are poor (meaning, officers are behaving in ways that get them sanctioned, reprimanded, arrested, fired and/or jailed, disproportionately to those in comparable geographic/demographic areas) for any six-month period, that manager is demoted or fired. If poor stats occur in any other 6-month period within two years in that same department under new management, the manager and his/her supervisor are both fired. V.- J. Develop and maintain national databases. We must do better at collecting data. All individuals’ attempts at being hired in law enforcement must be centralized. All actions of individuals working in law enforcement while hired must be tracked. Every departments’ outcomes and patrol statistics must be logged and searchable. V.- K. Data must be available to the public and to all types of law enforcement. Transparency is key. This occurs via body and dashboard cameras with both audio and video components and frequent checks of said equipment. All data entry must be supervised and checked regularly. 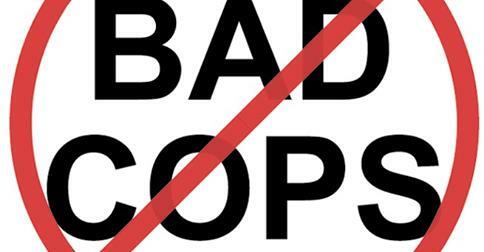 Most importantly, what should already always be happening, is that good cops and others doing a good job who work in law enforcement should NOT hide, protect or collude with those colleagues who should be fired or jailed. There are many sectors that do/do not support excellence in law enforcement officers. My post, here, recommends improvements in some key areas, but not all. Let others research and recommend further changes to address areas I have left out, please.